This summer brings four new and varied films about magic and its practitioners. I confess a weakness for these films. 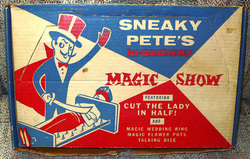 When I was about 10 years old, I performed magic tricks at children’s parties in really bad clown makeup with illusions that I learned from my Sneaky Pete Magic Kit. Since the kids were even younger than I was, they were pretty easy to fool and it was hooked. I made five dollars. When I saw Tony Curtis as Houdini in 1958, I started working with scarves and cards, and though I never hung upside down in a Chinese Water Torture Cell I did make a white mouse appear on stage just as Houdini had done with an elephant. David Blaine, Criss Angel, and of course, David Copperfield have used technology to create some highly sophisticated illusions, but films about magicians have been relatively rare. In 2006, Edward Norton starred in The Illusionist, which battled Christopher Nolan’s The Prestige at the box office. This year we also had The Incredible Burt Wonderstone with Steve Carell, Jim Carrey, and Steve Buscemi, which made $22 million at the box office despite tepid reviews. In 2011, the documentary Make Believe charmed audiences with a look at the national competition for World’s Best Teen Magician. That film explored the commitment of a slick group of savvy, young magicians. Judd Ehrlich’s Magic Camp, a film about child magicians, film puts us among 97 young conjurers as they devote a week to honing their skills and sharpening their performances. Many are slightly nerdy, a bit pudgy, and most confess to feeling socially awkward: their love of magic serves as an escape and, for some, a way to grow in self-confidence. The film doesn’t stick exclusively with these five magic makers as it explores feelings of camaraderie and homesickness that comes with being away from home at summer camp. We see groups of conjurers practicing their hand motions as well as coaching sessions on delivery, showmanship, creating a character, and even how to dance on stage. We get some insight into how a few tricks are done while we are immersed in the divine nerdiness of kids obsessed with being magicians. And their skills are pretty impressive, and, as with any good magic, watching it I found myself feeling like a kid all over again. If you are really interested in the art of magic, the documentary, Deceptive Practice: The Mysteries and Mentors of Ricky Jay, honors the history and artistry of some of its greatest practictioners (previously reviewed in The Arts Fuse). Inspired by a 1993 New Yorker article on Ricky Jay, the filmmakers spent years convincing him to share his knowledge of magic’s history, his collection of obscure memorabilia, and some of the background to his state of the art prestidigitation—though never his secrets. Jay is one of world’s greatest living close-up magicians and sleight-of-hand artists. Having seen his showRicky Jay and his 52 Assistants at the old Hasty Pudding Club in 1993, I can attest to the stunning dexterity, the seeming impossibility of his tricks. Introduced to magic by his grandfather Max Katz, young Ricky Potash began performing magic at age four and over the years became completely obsessed with its history, serving as an apprentice to such masters of close-up magic as Al Fosso, Slydini, Cardini, and Dai Vernon. His desire to honor these great artists is one reason the ordinarily private Jay agreed to the document his performances. Directors Molly Bernstein and Alan Edelstein have gathered together footage of a very young Jay performing, archival footage of the past masters, snippets from his live 52 Assistants show, and some breathtaking anecdotes told by those familiar with his performances. Since the 1970s, when a very long-haired Ricky Jay appeared regularly on television and opened for rock ‘n roll acts around the country, he has become a regular performer in the films of David Mamet (who also directed his stage show) and acted in a number of other films, including Deadwood on HBO. He has established a consulting firm on magic called Deceptive Practices, which advised on both The Prestige and The Illusionist. He is a speaker and author of books on conjuring literature, con games, sense perception, and unusual entertainments. What is most engaging is Jay’s ability as a storyteller and his respect for and knowledge of the history of the art. As he endlessly shuffles decks of cards, seemingly calling up any card at will, he thrills us with the stories of the masters with whom he studied. In an age of high tech spectacle and Las Vegas magic, this film honors the elemental thrills of Jay’s agile magic and his memories of a great tradition. Like many small, independent films, this may or may not make it to Boston, but hopefully there will be opportunities to see it on Pay-per-View or Netflix.Desperate Acts of Magic, written, produced, and co-directed by Joe Tyler Gold, weaves a love story and impressive magic tricks into a delightful plot. It has the goofy charm of a miniscule budgeted, made-for-TV movie, but the earnestness of its filmmakers and actors makes it into a more substantial entertainment. Gold also stars in the film as Jason Kant, a computer programmer who longs to be a professional magician. Kant meets his love interest in the form of Stacy, a beautiful feminist magician with a sharper attitude and better skills than he. Insulted by his suggestion that she should be relegated to an assistant’s role, Stacy leaves, and Jason puts together a very amusing act with Ellen (Sascha Alexander) who, though willing to be an assistant, is hopelessly ditzy. Antics, as they say, ensue. But so does the magic. Joe Tyler Gold is an experienced actor who has directed several small films and was a professional magician who has performed at “over 500 kids birthday parties.” I don’t know how he had any energy left over to make this film, but, in addition to authentic magic being part of the plot, he has put together a group of charismatic actors who create engaging characters. Discovering an under-the-radar film like this, personal, charming, and independent, is a magical experience. At the other end of the cinema spectrum is Now You See Me with Jesse Eisenberg, Woody Harrelson, Isla Fisher, and David Franco (James’s younger brother) as a quartet of magicians who become known as the Four Horsemen. The group is made up of a sleight-of-hand master, a mesmerist of questionable intentions, a magician-thief, and an escape artist. Following the instructions on a tarot card that mysteriously appears to each of them, they find themselves convening in a cleverly rigged apartment in order to receive instructions regarding a single goal. Ten years later, a collaborative mission, which they all apparently agreed to take on, is revealed: they will steal vast quantities of money from sealed banks and shower the loot over a gleeful public. It is a bit like V in V for Vendetta meets David Copperfield. How they do the tricks is cunningly explained, but for whom and to what purpose? It takes a couple of hours to find out. Multiple diversions (propelled by scant logic) are provided so that the Four Horseman can be pitted against tele-debunker Morgan Freeman, befuddled cop Mark Ruffalo, and a pretty Interpol agent played by French actress Mélanie Laurent. Fashioned by three screenwriters and the French director of Clash of the Titans, The Incredible Hulk, andTransporter 2, it’s full of humongous crowd scenes, outsized magic tricks, and plenty of car crashes. After a snazzy start with some nifty tricks, it devolves into a super hero movie accompanied by witless wisecracks and a predictable and unconvincing romance between the cop and the Interpol agent. Nothing is as it seems, or is it? Yawn. The hyperbolic tricks are mired in ordinary plot devices: authentic magic gives way to the pseudo spectacle of an overwrought, summer special effects blockbuster.